Looking for creative ideas for Restaurant Menu Covers? 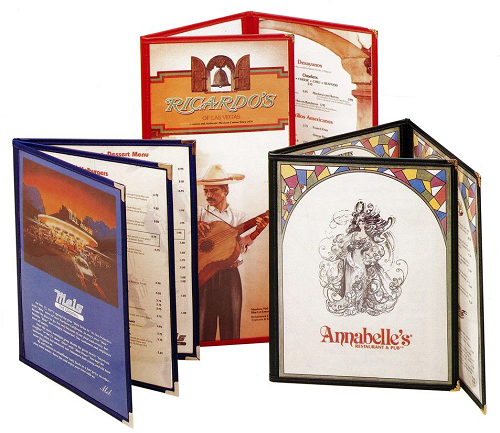 Restaurant menu covers come in many styles with numerous options, from simple and practical to exotic. Knowing what styles are available and the various material choices can be helpful in designing your perfect covers. When deciding on the style and creativity of restaurant menus the following aspects should be considered; the type of restaurant, the type of dining experience, theme, size of the menu, how often the menu is changed, budget, and the statement you would like the menu and cover to make. 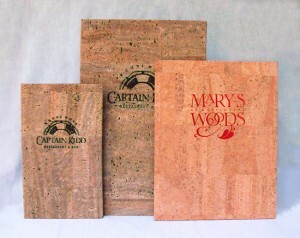 A practical menu cover for casual dining are the Cafe Menu Covers. This is a clear vinyl cover in which the actual menu is encased in vinyl with binding sewn around the edge and metal corners. 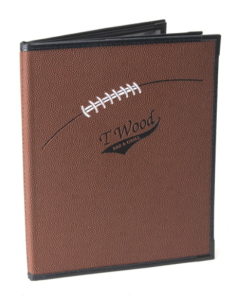 This cover can be made in various sizes, configurations or multiple pages to suit your menu as well as in various binding colors to match the restaurant decor. 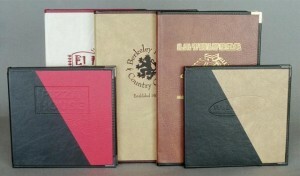 These menus can be made with pockets or short panels to display specials. There are a number of options for materials including nylon, leather grain or lizard skin. Another practical and durable cover is a Royal Cafe which has a hard cover with binding sewn around the edge and metal corners for durability. This cover offers many options including many configurations, multiple pages and can be made with clear vinyl pages which cover your menus or corner catches to slip the menu page into. 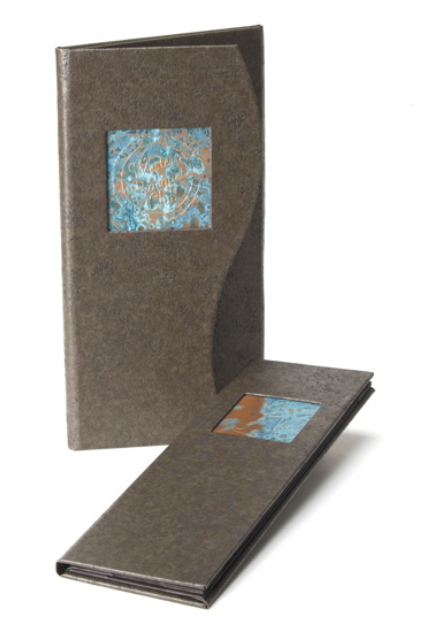 This style of menu cover offers lots of variety for design including matching, contrasting or coordinating the cover materials with the binding materials. Royal Cafe menu covers can also be manufactured with multiple cover material colors to create a two toned effect. Your restaurant name and logo can be de-bossed and/or foil stamped in a variety of colors. Some of the materials include basketball and football, great for sports bars. Think steak house with brown and white cowhide or deep leather grained material. A Turned Edge restaurant menu cover such as our Del Mar Series, offers almost endless opportunities for creativity. Turned edge covers are constructed with all edges French turned with no stitching and is generally padded. The solid cover is easily decorated with foil stamping in a variety of colors. These covers can be made with or without padding or in an ultra thin style for a thinner, lighter cover. The single page frame style works well for single page menus or wine lists. With a Frame Cover the menu page is inserted into the cover having the effect of looking as though it is in a frame. 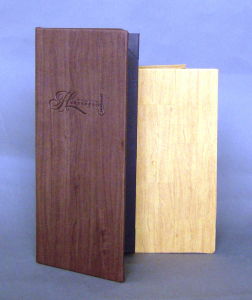 Turned edge covers are available in single panel for a one page menu or multiple pages to accommodate up to 8 pages of menu. The choices are many with Turned edge covers since they can be made of almost any material. A great option for wine lists, seafood restaurants, dining establishments by the shore, or with an ocean theme is natural cork. A basket weave material can be used for that tropical look and feel. Lizard skin works well for that Southwestern theme, or try Ostrich skin for a more exotic look and feel. Want a more art deco or modern look; explore some of the metallic materials. For a more antique look there are wood grain fabrics that look great. If cost is not a concern, real leather is available or if you would like real leather that is less pricy and more durable bonded leather looks, feels and smells wonderful. 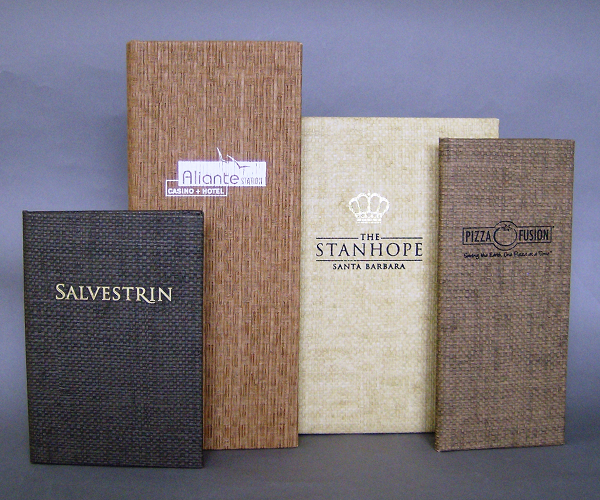 Many more options are available including linen and leather grained book cloth. Combine two materials or contrasting materials for that truly one of a kind look. There are many design options that can be implemented with turned edge restaurant menu covers such as windows on the cover to frame a picture, photo or metal inserts. Metal inserts are made of embossed copper or aluminum and are available in different finishes. Pictures or renderings can be laminated on to the cover as well as foiling of designs, logos and establishment name can be added in single or multiple colors. Creating a unique restaurant menu covers can be easy and enjoyable with the many options and materials available on the market today. Looking for more creative ideas for restaurant menu covers, consult our customer service for assistance. Most of our Restaurant Menu Covers are available with matching Wine List Covers and Check presenters.